Fashion and Textiles students at Gray’s School of Art are getting their teeth into a unique project brief – creating statement pieces entirely from recycled materials. 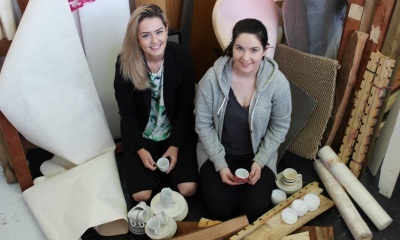 The project, which aims to raise awareness of sustainability and zero waste, will see the 26 Stage 3 students working in groups to create the pieces with materials provided by social enterprise Community Food Initiatives North East (CFINE), as well as waste materials from the art school. The different groups have been assigned specific materials to work with, including crockery and tarpaulin; ring binders and foam packaging; sponge foam; wood; and polystyrene and Perspex off cuts. Once the final pieces have been created, a judging panel will select a winning design to go on display in the window of the Cancer Research shop on Aberdeen’s Union Street from April 25 to May 5. Stage 3 Fashion and Textiles co-ordinator, Rachel Heeley, said: “Being sustainable is a really important issue and it is one that, as designers, our students need to be aware of. “It is something that I’m personally very interested in – I hate to see things going to landfill during day to day life so I thought it would make for an interesting project. She added: “It’s great to be working alongside CFINE and Cancer Research in Aberdeen on the project and also for the students to be working on another live brief which broadens their skills and experience. Student Kerrie Davidson (25) said: “I think it is a great project because it shows that designers do have a role to play in creating awareness around certain issues with their work. Course mate Tamsin Russell (21) added: “It is a really good opportunity because it is so unusual to create something fashion related out of these types of materials. The judging panel will consist of Agnes Keilloh, retail manager at Cancer Research; Liina Roostoja, Recycling Officer Aberdeen City Council; Sarah Robertson of CFINE; and Lyndsay McNeill, PhD student at Gray’s.